Watch our quick overview videos below to learn about our training for Recruiters and Managers. 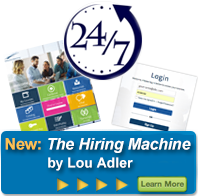 The first step is Performance-based Hiring for Recruiters Online. Carl Bradford’s professional background spans over 40 years and includes a broad variety of management and consulting experience in human resource management and training for both U.S. and international operations. Earlier in his career his roles included Director of Human Resources for global operations and Vice President of Training. In addition to his role with The Adler Group, he also owns a national search firm. Carl is currently a National Practice Director with The Adler Group. One of Carl's key roles includes overseeing the recruiter certification program for The Adler Group. In addition, he conducts national search assignments for both senior and mid-level management and technical talent. Carl has a Bachelors degree in Education, complemented by numerous specialty training courses dealing with human resources, sales and management training. Carl has also been certified through Behavioral Sciences Research Press and Carlson Learning Companies for administration and interpretation of specialized testing and evaluation instruments used for appraisal of the sales style and potential, personality styles and team building activities. The Zig Ziglar Corporation has also certified Carl as a trainer for their management course.